Edna Cano Flowers, a native of Benque, Belize, was 20 years old when she was awarded the GOJoven Fellowship. 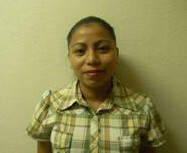 Edna has experience teaching high school Social Studies, Geography, Life Skills and Spanish. She has managed through creativity and strategic thinking to cover sexual and reproductive health (SRH) topics with her students. Edna has also served as the Adjunct Treasurer for the GOJoven Belize Alumni Association (GOBelize) and is a graduate of the GOJoven Training of Trainers process. She has an Associates Degree in International Business and for her future hopes to be an even better teacher and possibly a principle of a school where she can set an example of good leadership, providing positive direction and meeting the needs of the students.